for teams, businesses, and other groups. For over 18 years we have been designing and creating customized spirit wear, team uniforms, corporate wear, trophies, and promotional products for groups across Virginia, Maryland, and Washington D.C.
We strive to make the process of creating custom apparel easy and enjoyable. We are a family-owned business and we love being able to help our community. You can expect to receive great customer service and fair pricing, along with an outstanding finished product. Printing ink onto a substrate using individual screens. Best suited for mass-production jobs, we can print hundreds of shirts an hour. A variety of ink styles allows us to create printed logos that meet your needs. 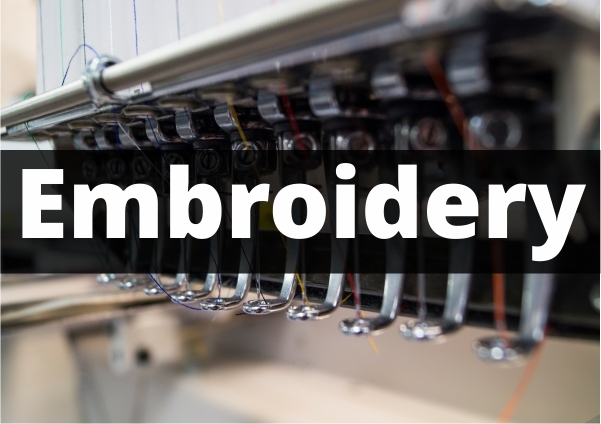 Decorating apparel or other materials using a needle to apply threads. Can use multiple colors in a logo. Logos should be bold and void of small text and details. Can be used for a variety of purposes, including team or school spirit wear, staff/employee apparel, and many others. Great way to raise money for your group. Takes away the hard work of collecting order forms and money. Check out our current Banner Special! Full-color CMYK printing - no limit on the number of colors that can be used in the design. Fully custom logos, no minimum order. Represent your hard work and achievement in athletics or academics. Sizing samples available, orders must be placed at our store. Celebrate your team’s accomplishments on and off the field. Orders are finished in 1 week. Custom-cut names, numbers or logos can be done in a variety of colors, materials, and layouts. We do more than just apparel! Let us take care of your team’s needs. Great selection of brand names and off-brand products to cover any of your needs.